MechWarrior is a 1989 computer game published by Activision that is set in the BattleTech universe. The game was originally released on MSDOS, but to coincide with the release of BattleTech in Japan it got ported to the systems popular there at the time. These ports for X68000 and PC-98 were released under the name BattleTech: Stolen Chalice and were created by Victor Musical Industries, Inc.. They are identical to the 1989 release, except for completely new, high quality pixel art. A SNES port of the game exists, but in this version the backstory was altered and it has a different main protagonist, among other changes; it should be regarded as a separate game (see MechWarrior (SNES)). In the PC game, the player (as Gideon Braver) takes command of the Blazing Aces mercenary unit in his quest to uncover a hideous plot, retrieve a vital artifact and avenge the murder of his family within only five years. He gets to manage the unit's finances and negotiate contracts, can purchase and sell BattleMechs, hire and fire other MechWarriors for the unit (which can thus grow up to Lance size), and controls Gideon's 'Mech in combat. Most importantly, however, he must follow leads and gather information about the events on his homeworld. Ultimately, he must find and defeat the Dark Wing unit to reclaim his heritage. Text scenes in the game sometimes require the player to choose between the alternatives on how to proceed. Choosing the wrong alternative can result in Gideon's death. It is also possible for Gideon to die during the 'Mech combat, but this rarely happens and usually requires the direct hit to the cockpit. Returning to Ander's Moon also results in arrest and execution, unless the game's objectives are already entirely accomplished and Gideon's innocence is proven. Over the course of the game, prominent events taken from various novels are mentioned in the news, covering items from The Gray Death Trilogy (Verthandi Rebellion, Sirius massacre, events on Helm) and The Warrior Trilogy (following the Solaris career of Justin Xiang Allard up to the wedding of Hanse Davion and Melissa Steiner and the subsequent Fourth Succession War). 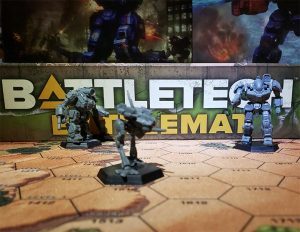 Computer games are explicitly excluded from the list of products that contribute straight Canon to the BattleTech universe yet at the same time it was stated that the IP owners are "not in total denial about these sources either". It has also expressly been stated that fluff from certain official, licensed products (namely certain computer games including those produced by Activision) can be assumed to be part of the shared universe as long as it is "not directly contradicted, and makes sense". Gideon Braver Vandenburg is the son of Duke Cameron Vandenburg of Ander's Moon. The world was colonized centuries ago by the Vandenburg and McBrin families and was rewarded with a Dukedom by Prince Davion for the valor of its warriors in the Succession Wars. Upon the death of the old Duke, the new Duke is elected by the Council of Representatives and anointed with oil from the sacred Chalice of Herne, an ancient artifact from old Terra that had come to symbolize the office of Duke. The title has thus passed between Houses Vandenburg and McBrin over the centuries, creating a bitter rivalry. On March 1, 3024, Gideon Braver Vandenburg left Castle Vandenburg, his father's stronghold, for an inspection of the family's holdings. Upon his return two days later he found that a Lance of BattleMechs had attacked the Castle, killed his family and stolen the Chalice of Herne along with other treasure. This turned out to be an intrigue by Jarris McBrin, who coveted the title of Duke for himself. To discredit and vanquish House Vandenburg, McBrin forged evidence to suggest that they had worked with and then double-crossed the pirates. He failed to convince the Council of Representatives to elect him Duke, however. Instead, they chose to delay the election of a new Duke until Gideon Braver Vandenburg had reached adulthood (23 years of age) on April 8, 3029. Shortly after the Council's decision, Gideon Braver Vandenburg found himself falsely accused of conspiracy and crimes against the state and was forced to flee off-world. Jordan Rowe, a friend of the Vandenburg family, provided him with safe passage on a DropShip, some money and an old Jenner. Upon arriving at a nearby world, he abbreviated his name to Gideon Braver to avoid "complications", and created a small mercenary outfit, the Blazing Aces. Inquiries about the insignia seen on the BattleMechs that had pillaged Castle Vandenburg point Gideon to Grig Griez, a wanted crimelord operating from within the Draconis Combine. On Land's End he finally meets one of Griez's henchmen. Eventually, Gideon Braver gets to meet Grig Griez in person and agrees to deliver a message to one of Griez's agents on Dustball in exchange for information. On Dustball, the recipient who calls himself Brown draws a gun on Gideon Braver (apparently acting as the message ordered him to do) but does not kill him when the "message" turns out to contain a deadly poison; Griez obviously wanted both Gideon Braver and Brown dead. Brown then tips Gideon off to a JumpShip named the Stone Arrow, a smuggler ship operated by a man known as Kangaroo Jack. To contact him, Gideon tracks down Jack's estranged brother who serves as a Scorpion pilot with Smithson's Chinese Bandits on garrison duty in the Free Worlds League. He points Gideon to a world in the Federated Suns where Jack "has a woman". Immediately after meeting with the Scorpion pilot, another assassination attempt is made against Gideon Braver near the garrison's Saladin hovertank garages - he suddenly finds himself under attack from a sniper with a heavy gyroslug carbine. The attack is carried on the news on the next day, where it is reported that terrorists attacked the 5th Armored Rangers at their garages. In the Federated Suns, a man named Kearny is named as a contact to meet Kangaroo Jack. Kearny gives Gideon a slip of paper with an address where Gideon is to meet with Kearny in one hour if he wants to meet Jack, and also informs Gideon that it had been the Black Widow Company who had been moved to Ander's Moon with the Stone Arrow and attacked Castle Vandenburg bearing false unit insignia. However, Kangaroo Jack is murdered before Gideon can meet him. For a lack of other leads Gideon Braver then approaches Natasha Kerensky, commander of the Black Widow Company, in a bar in the Draconis Combine. Confronted with the accusations, Kerensky denies any involvement and a barfight ensues where only the intervention of a mysterious woman named Tasha saves Gideon Braver from a very severe beating by the Black Widows. Tasha reveals herself as a MI6 operative to Gideon and later provides him with data files that reveal a Draconis Combine company, Matabushi Incorporated, to be behind the Dark Wing and the attack on Castle Vandenburg as part of their Operation INROAD. She also reveals Kearny as a Kurita agent working for the ISF; the Black Widows really had nothing to do with it. Kearny had just set Gideon up to get himself killed by the Black Widows. On the sidelines, Jordan Rowe is also implied to be working for Matabushi. Following a message to seek out alleged MIIO agent Kearny on Albiero, Gideon winds up in an attack by the MI6 against the Matabushi HQ there that culminates in a showdown aboard a Karnov heavy transport helicopter between Tasha and Kearny, accusing each other of being Kurita operatives at gunpoint before Gideon's eyes. Gideon elects to trust Tasha who subdues Kearny and explains that the MI6 had an independent mission against Matabushi underway, but saw Gideon Braver as having the same target. Her own mission accomplished, she provides the Blazing Aces with detailed data on the whereabouts of the Chalice of Herne, which is guarded by the Dark Wing for Matabushi. She also hands him a share of the loot: 5,000,000 C-Bills. With this information, Gideon Braver Vandenburg and the Blazing Aces eventually find and defeat the Dark Wing, and reclaim the Chalice of Herne within five years after it had been stolen from Ander's Moon. The retrieval of the Chalice, together with the data disk on Operation Inroad, clear the Vandenburg name and the family title and honor is restored. Over the course of his adventures, Gideon Braver accepted many short term contracts for the Blazing Aces from one or more Successor States of the Inner Sphere. Within the game's combat sequences, only eight different 'Mech designs are available for either side: Locust, Jenner, Phoenix Hawk, Shadow Hawk, Rifleman, Warhammer, Marauder and BattleMaster. Neither the player and his unit nor enemy forces can acquire or field 'Mechs of any other type. However, over the course of the storyline, a Scorpion features prominently in the narrative and yet other 'Mech models (including Atlas and Griffin) are mentioned at various points in the game, although they are not playable. The game data files do contain the stats for the Wasp and Wolverine, but they are not playable either. JJ Kitter Good Excellent 1,000 who "spent some time with the Waco Rangers and Miller's Marauders"
S. Miller Average Good 600 who claims she "practically grew up in the 3rd Recon Company"
D. Sajak Poor Average 400 who says "D is for Desire." 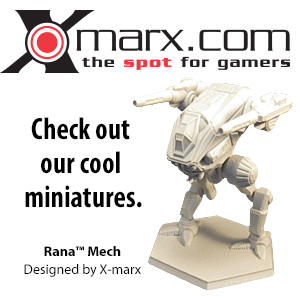 Zera Tith Excellent Good 2,000 whose "last gig was Helmar Valasek"
The world of Ander's Moon is not mentioned anywhere else in the BattleTech canon, but its position on the game's somewhat warped starmap roughly corresponds with Elidere IV, as does much of the political and economical information. This page was last edited on 19 December 2018, at 18:30.